MultiChoice, the pay-TV company that owns DStv and M-Net, made a questionable payment of R25m to the Guptas' controversial ANN7 channel, the #GuptaLeaks show. In addition, MultiChoice increased its annual payment to ANN7 from R50m to R141m. The payments came after the family seemingly assisted former communications minister Faith Muthambi in getting President Jacob Zuma to transfer certain broadcasting powers to her, something MultiChoice was lobbying the minister for. By NEWS24. Muthambi’s decision flouted her own party’s policy on the issue. The ANC supported encryption – required for pay-TV – to promote competition in the sector. VIEW ALL THE RELATED DOCUMENTS. After a lengthy court battle, the Constitutional Court earlier this year ruled that it was within Muthambi’s right to make policy decisions affecting the broadcasting sector. CLICK HERE TO READ THE COMPANY’S FULL RESPONSE. MultiChoice CEO Imtiaz Patel was once a director of a company with the youngest Gupta brother, Tony, and Zuma’s son Duduzane. Patel says his appointment was done without his permission, and CIPC records show that he resigned from the company on the same day he was appointed. The Guptas did not respond to questions but have previously dismissed the #GuptaLeaks as “not authentic”. The pay-TV giant denied signing a “third channel amendment agreement” which would have taken ANN7’s annual income from MultiChoice to R150m, but neglected to disclose the existence of a “fourth channel amendment agreement”. This document was unearthed in-between the more than 200,000 emails that have become known as the #GuptaLeaks. The agreement was signed by MultiChoice’s Glen Marques and Nazeem Howa for Infinity Media Networks, ANN7’s holding company, on September 9, 2015. The agreement not only ensured that MultiChoice would fork out R141m a year for ANN7 from April 1, 2016, but also guaranteed the Gupta-controlled company a “once off amount” of R25m. Two broadcasting insiders who had previously been involved in MultiChoice’s negotiations with news channels say such a “once off amount” is unheard of in the industry. “The once-off fee you refer to is a pro rata payment in terms of an amendment agreement. The amendment agreement was entered into in order to assist with improving production quality,” MultiChoice said about the payment. MultiChoice also maintains that its fee for ANN7 represented a “fair value” at the time of signing the fourth contract amendment, given the cost of running a 24-hour news channel. “After several rounds of negotiations over a period of three years, during which we developed an understanding of the channel’s operating costs and the need for improvements in production quality over time, the final fee was set,” says MultiChoice. The company also denies that it was aware that Muthambi was forwarding MultiChoice’s suggestions to the Guptas. “MultiChoice has absolutely no knowledge of the minister sending our proposals to any other person, and can in no way be held responsible for that,” says the company. The issue at hand involves a long-running battle over whether government should favour either encrypted or unencrypted set-top boxes for the country’s digital migration process. Critics of a policy supporting unencrypted set-top boxes argue that would-be rivals of MultiChoice can only compete with the latter’s DStv service if government enforces the roll-out of encrypted devices. In December 2013, then-communications minister Yunus Carrim published proposed amendments to government’s digital migration policy that opened the door for encrypted set-top boxes. Minutes later, Muthambi again emailed Chawla, this time attaching a Microsoft Word document titled “Effect of presidential proclamation”. The document was forwarded by Chawla to Tony Gupta on the same day. The document’s metadata reveals that its creator was Clarissa Mack, MultiChoice’s then-group executive for regulatory and policy affairs. Mack created the document on July 17, the day before Muthambi forwarded it to Chawla. Mack was also the last person to have modified the file. Mack wrote that when Zuma created the two departments, there was an “assumption … that broadcasting including digital migration would report to the Minister of Communications”. “The proclamation published on 15 July 2014 did not give effect to this division,” complained Mack. She also made detailed suggestions with regards to how the relevant decision-making powers should be split between Muthambi’s and Cwele’s departments. Mack’s letter made it clear that MultiChoice wanted key powers guaranteed by parts of the Electronic Communications Act to be transferred back to Muthambi. “Broadcasting is regulated by the Electronic Communications Act, 2005 (Act No 36 of 2005). The ability to make broadcasting policy and issue broadcasting policy directions are set out in section 3 of this Act. These powers have been transferred from the Minister of Communications to the Minister of Telecommunications and Postal Services,” Mack stated. “It is therefore the Minister of Telecommunications and Postal Service [Cwele] who will make policy and issue policy directives to Icasa for broadcasting, including public service broadcasting,” Mack added. Over the course of the next few months, Muthambi would send Chawla four other documents relating to broadcasting policy. Chawla forwarded most of these to Tony Gupta and Duduzane Zuma, the president’s son. On July 25, Muthambi sent Chawla a Word document called “proclamtion [sic] new 18 July 2014”. “These sections must be transferred to the Minister of Communications,” Muthambi wrote to Chawla. Muthambi also sent Chawla a Word document called “Responsibility for Infraco and Sentech” on July 25, adding in her email that “Sentech’s signal distribution must rest with the Ministry of Communications”. Apart from Icasa, Sentech is a key role-player in the digital migration process, whilst Broadband Infraco is a state-owned telecommunications company. Perhaps the most shocking aspect of Muthambi’s communications with Chawla came in the form of a document called “final proclamation 01 August”, sent by the minister to the Gupta associate on the date mentioned in the document’s title. “See attached Proclamation that President must sign,” Muthambi wrote Chawla, who subsequently forwarded it to Tony Gupta. On November 25, Zuma signed proclamation 79 of 2014. With the stroke of a pen, Zuma gave legislative effect to the transfer of some of the powers advocated for in Mack’s documents. Muthambi wasted little time to make use of her newly-won policy powers. In March 2015, she stunned the broadcasting industry by issuing an amendment to government’s digital migration policy that went directly against her own party’s stance on the matter. The new set-top boxes would “not have capabilities to encrypt broadcast signals,” declared a clause Muthambi inserted in the amendment. Only two months before, at the ANC’s January lekgotla, the ruling party stated that it supported Carrim’s December 2013 policy, which had paved the way for encrypted set-top boxes. In her response to News24, Muthambi admitted that she had received “submissions” from MultiChoice “sent … through Ms Mack”. But Muthambi says that she had “opened the door” for such submissions after the July 2014 proclamation caused “confusion and uncertainty” over which of the two departments would be responsible for broadcasting policy. “The minister denies having been influenced by any person in the finalisation of the digital migration policy after consideration of all submissions by all interested parties…” Muthambi’s spokesperson said in a statement. MultiChoice also said that it was one of “several stakeholders” who made submissions to the minister. Neither MultiChoice nor the minister indicated which other parties, apart from MultiChoice, made submissions to her office. 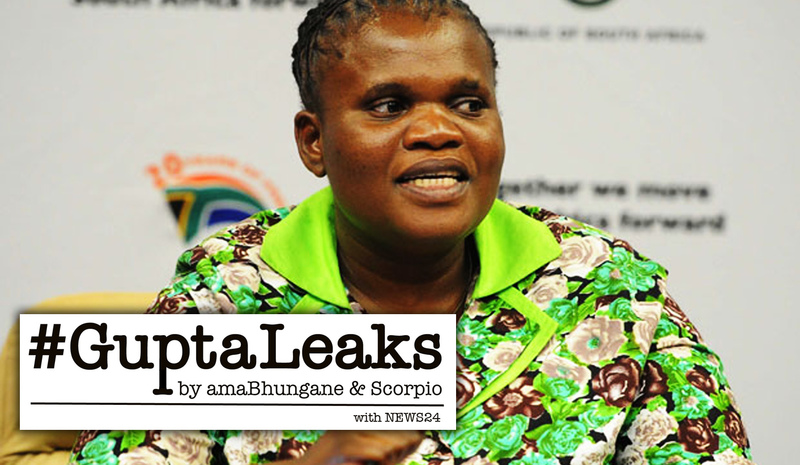 Muthambi also failed to address News24’s detailed queries about the emails she had sent to Chawla. On December 4, 2014, about a week after Zuma transferred the relevant broadcasting policy powers to Muthambi, Howa sent Tony Gupta a draft “third channel amendment agreement” for the deal between MultiChoice and Infinity. The signed “fourth channel amendment agreement”, however, reveals that MultiChoice first agreed to increase the ANN7 fee to R100m per annum, before ultimately settling on an amount of R141m. But it is the “once off” payment of R25m that has industry insiders most concerned. “It is unheard of. I haven’t seen any once-off payments [in] any of the agreements with MultiChoice that I’d been privy to,” said one of the industry insiders. The two sources, along with a third industry expert with direct knowledge of MultiChoice’s agreements with news channels, all agree that even R50m per year would constitute a bad investment for MultiChoice. “What they pay ANN7 compared to what they get from it [the agreement] makes no commercial sense. It is such a bad channel and its viewership is so low that ANN7 actually needs to pay DStv to be on their platform,” said one of the sources. Data obtained from the Broadcasting Research Council (BRC) shows that ANN7 secured only 8.93% of DStv’s news audience in 2014, and 10.98% in 2015. Its average daily viewership figures for 2014 and 2015 were 6,215 and 8,157 respectively. SABC News held news audience shares of 19.90% (2014) and 22.46% (2015) and it drew 12,379 and 15,412 average daily viewers in those two years. eNCA’s average daily viewership was 29 481 (2014) and 32 265 (2015) and it had a news audience share of 54.28% in 2014 and 52.71% in 2015. Despite ANN7’s relatively low audience figures, MultiChoice maintains that it believed the fee increases were justified. “We believe the fee represented fair value at the time, particularly considering that ANN7 was a start-up channel requiring significant initial investment to get off the ground – as opposed to others, who could leverage existing infrastructure and content,” said MultiChoice. Asked about his relationship with the Guptas, Patel said he couldn’t remember when he first met the Guptas.